High Density Baskets - With DSI's core mission to optimize space and employee efficiencies, our core High Density Baskets are a perfect solution for 2-bin Kanban. This system is very similar to the conventional 2-bin wire and plastic bins system but utilizes HD baskets. Two bins/compartments will still be utilized within the high-density basket but the dividers can be adjusted based on the size of the supplies and the varying PAR levels which provide more flexibility. Different types of labeling systems can be used to indicate that an item needs to be replaced in that basket all while using the same approach of the 2-bins, FIFO concept. Conventional Open Shelving & Plastic Bins - With this system, items are consistently stocked from the back, using the first in first out approach (FIFO). When the first bin runs out, the employee who uses the last item places the empty bin in a common area. While the team waits for the new supplies to arrive, there’s already a full bin on the shelf — it’s been there waiting behind the previous bin — and it’s ready for the next employee to pull from. Materials Management then pulls all the empty bins, restocks the bins with supplies, and then places them behind the existing bin on the shelf that’s been pulled forward. Elimination of waste - With our High Density baskets, we reduce the square footage dedicated to supply storage by compartmentalizing the small to medium sized inventory in custom configured compartments. Compare this to your current model with traditional shelving and you may find you can save nearly 40-60% of your floor space. The smaller the supply area the better as you'll gain more control of your materials, reduce confusion when searching for consumables, and ultimately have more space for patient needs. 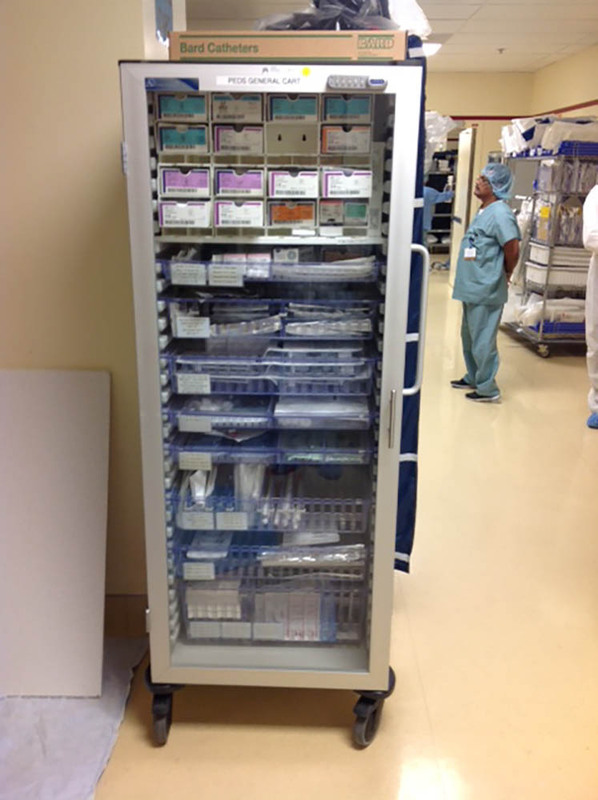 Bottom line, we provide a LEAN storage system that enables you to reduce your Operating Cost while Increasing Patient Care. Inventory Reduction - You will see an overall reduction of your traditional PAR levels through significantly better reporting. In addition, you will see improved rotation of your stock with the elimination of expired inventory and overstock. Bottom line, we help you reduce your inventory levels while still having enough inventory in stock to get the job done. Improved Productivity - Consider how difficult it is to navigate and manage your current supply rooms. Our 2-bin process dramatically reduces time to count and eliminates the need to interact with every line item. This also means improved inventory accuracy and no more "eye-balling" of supplies to reorder. Restocking is also quick, efficent, and easy for your Nursing staff and Materials Management staff, as they will no longer be required to restock in small issue quantities. Improved Employee Morale - Our materials management 2-bin Kanban philosphy bridges the gap between the Nursing Staff and Supply Chain through better organization and improved inventory levels. 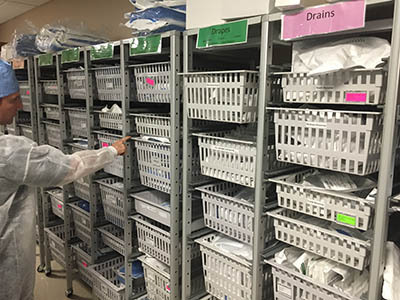 Nursing satisfaction will go up as the burden of materials management is reduced as they are enabled with a grab and go technique while spending more time with patients. DSI will own the inventory transfer process from start to finish as we transfer your supplies from the old storage system into the new Kanban system. DSI also works with you to identify the challenges in your supply chain and eliminate waste. Your high dollar inventories may be mismanaged; your inventory may be spread out in too many places; your nurses may lack the time and tools required to effectively manage inventory levels. DSI's highly trained storage experts will work with you to expose your highest risk areas and implement solutions to address your specific needs. By following our LEAN philosophy and process, you will see immediate benefit for your nurses, your patients and your bottom-line. Based on historical usage data, DSI work with Supply Chain and Nursing Staff to establish PAR levels levels to ensure stock for a given time period. Your PAR quantities are then placed into our high density storage units which are divided into two equally sized bins - Main bin and Backup bin, split 50/50. As care-givers need supplies, they pull from the Main bin. Inventory techs review physical storage areas for empty Main bins and record them via handheld device. It's a quick and easy way to spot what inventory is needed. As stock is replenished, Backup is moved first to Main, and then new supplies are placed in Backup.